Chances are they are there because of a surprise inspection or they have received information that you have violated some sort of compliance issue. Whether the complaint came from a disgruntled employee or it was just your lucky day, you may be about to get hammered with a nice, hefty fine. Bang! There goes this year's bonus. Violations can happen...You’re busy. Regulations can change often and you may never receive notice, or sometimes the agency just shows up and surprises you. Question: Did your hazardous waste company know about the potential violation? Answer: If so, why didn't they help you fix it? Question: Did your hazardous waste company NOT know about the potential violation? Answer: If they didn't know, why didn't they know? Obviously, you need to comply with correcting the violation. If you have found your hazardous waste company has let you down and you're not sure how to find one, our article How To Choose A Hazardous Waste Disposal Transporter can help you. This is not a how to article. Every agency and the steps to correct each violation are different. Working with your hazardous waste company to ensure that your operations are already in full compliance with federal and state regulations, is one of the best steps you can take. This is one of the simplest and most common infractions. Safety is number one! Safety for your employees and anyone who comes in to contact with hazardous waste need to know what kind of chemicals they are dealing with especially in case of an emergency. Remember to put start dates on ALL containers. It verifies that you are not storing waste onsite longer than rules allow. Name and address of the facility, date the first drop of waste was placed in the tank or container – accumulation start date, identity or source of the waste – example, spent plating solution, what makes the waste hazardous – does it contain, cyanide, dissolved metals, or acid?, the hazardous characteristic of waste – is it toxic, corrosive, ignitable, or reactive?, the physical state of the waste – is it liquid or solid? Below is an example of a properly filled out container label. How do you know if your waste is hazardous? The hazardous waste identification (HWID) process is the first step in hazardous waste management and it is the most crucial. Is the material a solid waste? Is the waste a listed hazardous waste? Does the waste exhibit a characteristic of hazardous waste? It is important to work with your hazardous waste company to help you classify waste correctly. Hazardous waste generators are required to determine if their waste is a hazardous waste by either knowledge of the waste stream or by testing it, and must maintain the records of that determination. It is also important to treat unknown material as hazardous waste during the determination process by properly marking storage containers until a final determination is made. For a complete list of the Top 10 Hazardous Waste Violations, download our FREE ebook. Simply filling out paperwork incorrectly can lead to major regulatory problems and fines. RCRA has major provisions regarding “cradle to grave” requirements. These requirements are directed by the EPA who establishes control on the management of hazardous waste from the start of the generation process, transportation, treatment, storage, and all the way to the disposal of hazardous waste. They trace every step of the way. Once your hazardous waste is stored and labeled correctly you must complete the Hazardous Waste Manifest, which outlines what types of waste you are disposing of and how much. These documents must be mailed to both state and federal agencies such as the EPA and Department of Transportation. These documents are to ensure that your waste is appropriately being handled and within the law. In other words, you're not dumping your waste in a hole in the middle of the desert. Is Your Waste Being Delivered Properly? Your hazardous waste transporter will then pick up your waste, which must be disposed of within 10 days to a designated facility. The facility must send the signed manifest to the DSTC within 30 days, stating that your waste has been delivered and processed correctly. If you fail to have your waste disposed of by a designated facility and the DSTC does not receive completed and signed manifest, the DSTC may pay you a visit. That is why it is extremely important to hire a professional and reliable hazardous waste transporter. 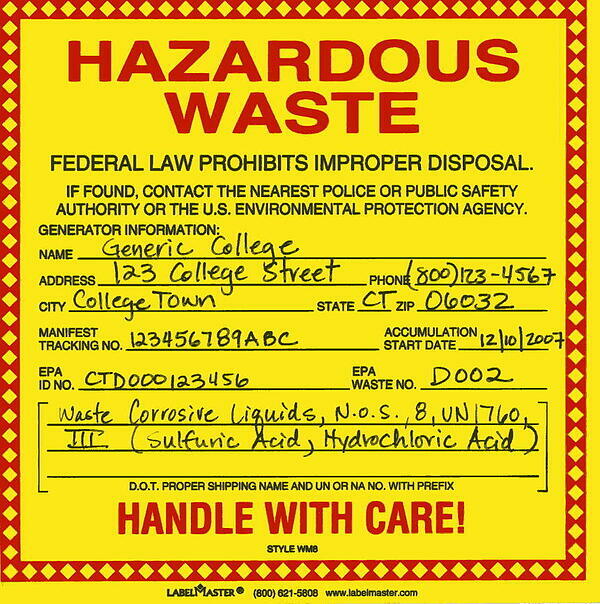 Hazardous waste laws can be a complicated process for many companies, both small and mid-sized. It can be costly for a company who does not work with a hazardous waste disposal company. Facilities and operations managers can only keep up with so much regarding complicated environmental laws and California rules and regulations. By not having a professional and reliable hazardous waste disposal company manage and dispose of your waste streams, you could be doing yourself a disservice. Many organizations, who don't use a waste disposal company, tend not to be ready for regulatory inspections and may incur large fines as well as the cost of fixing the problem. Are you ready? As you know, working with hazardous waste is serious business. If you need help, reach out and ask.